In the last few days we experienced many changes in our surroundings and our bodies. In 53 miles we walked from desert to pine forest, and from 3500 feet of elevation to 8600 feet. 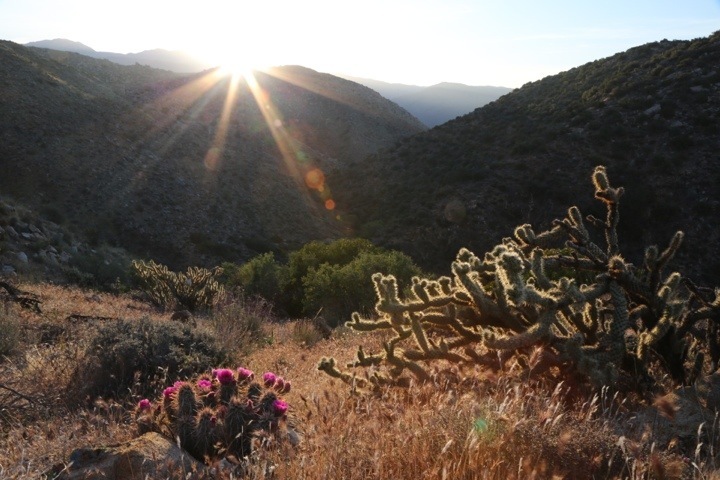 Cacti and scrub brush dominated the low lying desert landscape of the Anza Borrego Desert State Park. 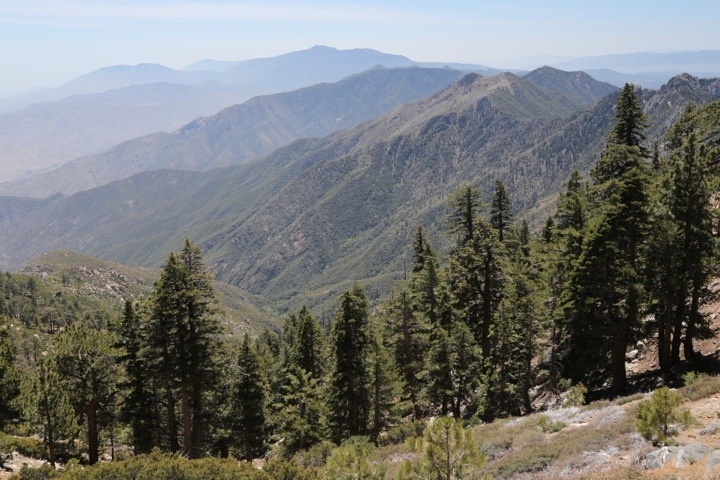 By contrast, in the high peaks of the San Jacinto Wilderness, pine trees hugged the mountainsides. In the desert we rose early, before 6, to walk a few miles before the sun’s heat grew intense. Around noon we found a shady spot to cook dinner and rest. 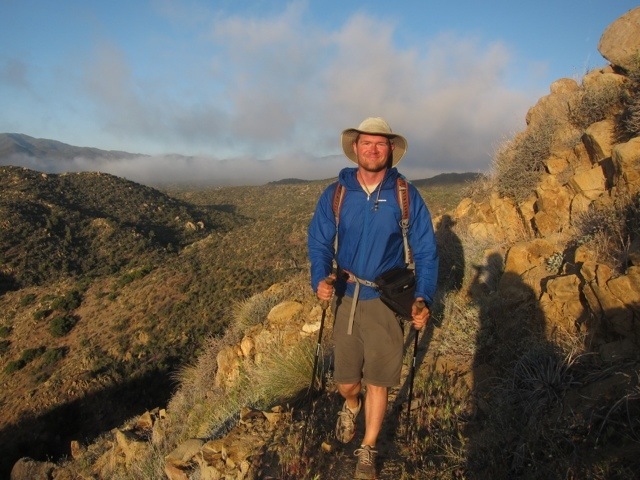 Conversely, high in the San Jacinto range, the temperature was much cooler so we could walk comfortably mid-day. Due to the temperature difference, water availability also differed dramatically between these two sections of the PCT. 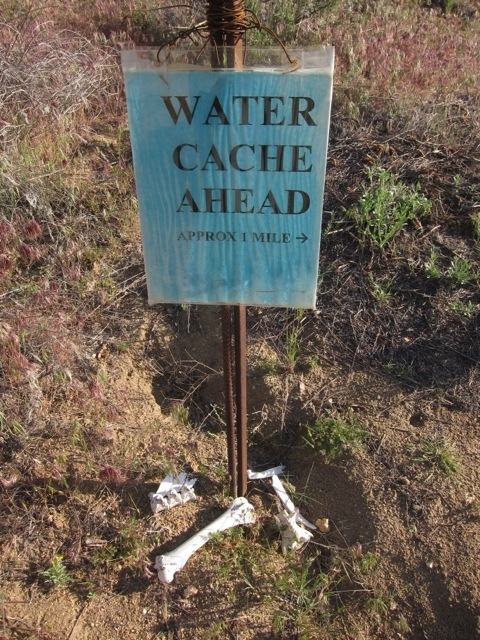 In the desert, water was scarce and we were ever mindful of our distance to the next spring, cistern, or water cache. Water’s scarcity made it precious, and we were especially grateful for it. At 8000 feet, water was all around us in the form of snow! It was exciting to observe all of these changes in such a short period. After living outdoors and hiking long distances for over two weeks, our bodies are beginning to adapt. Most notably, we have experienced greater hunger, and tend to snack all day long. As our bodies adjust to our walking pace, they are also demanding more sleep, typically 10 hours each night. At first glance, our dirtiness was the most visible change. We took our first showers of the trip today, and did our first laundry. We look strangely clean now and are ready to get dirty again! Another great post that describes so well what you are experiencing. And some more breathtaking pictures! The lighting in the Anza Borrego shot captures incredible beauty, and the picture of the red and gray branch is astonishing. They both take my breath away. And what fun to see you going from desert to snow so quickly. 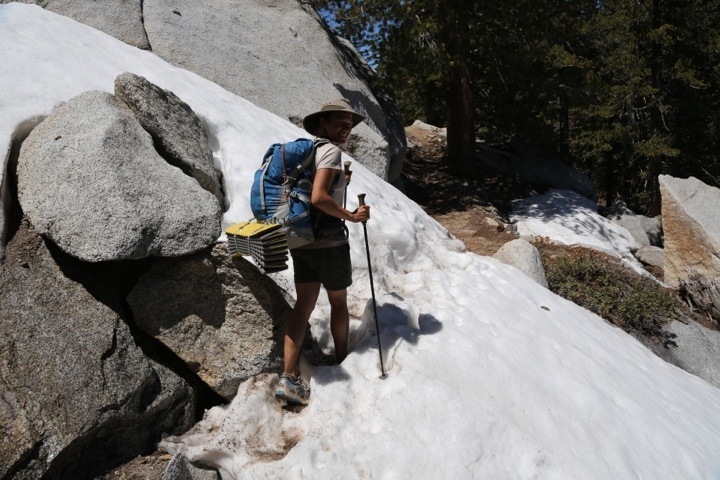 How was hiking in shorts through the snow? Thanks Mom! 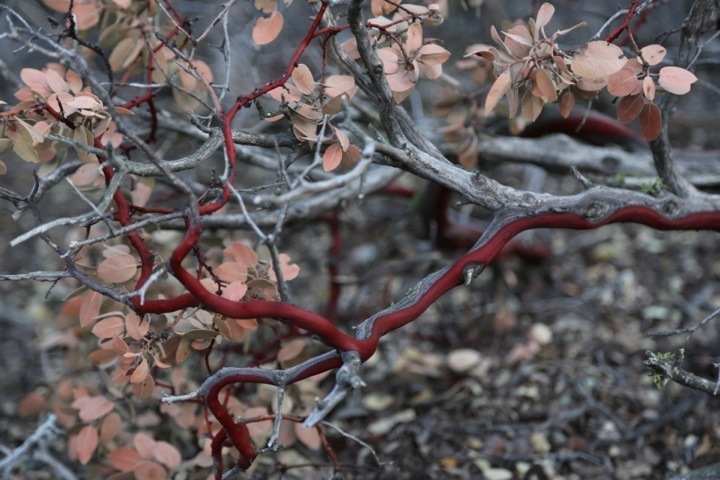 The red branch is manzanita, which carries its nutrients on the outside in that red coating. Walking in shorts in the snow was no problem, because it was actually quite warm! The snow sticks around for a long time in the shade at high elevations, but the highs can be in the 60s. Just another of the unusual circumstances we are encountering on the trail. And being one of your first ten contributors to the Nature Conservancy, we just got our postcard of the PCT trail! It’s great and has taken its place on our refrigerator. Thank you very much. For anyone who isn’t aware, Chris and Anna are raising money for the Nature Conservancy as they hike. Just click on the newt found on this page to learn how you can contribute. We’re glad you like the postcard! And thanks for mentioning The Nature Conservancy too, and for donating. They do great work and are a very worthy cause. I’m really, really enjoying reading your blog. If I have 10 unread emails, and I see your post, I read it first! Are you sticking to your daily miles, or are you walking more than you had planned? Thanks Sasha, that’s awesome. It’s hard work putting together entries on our phones out here, but we love sharing the adventure with people like you. We have been sticking to our plan so far, gradually increasing our miles per day. We are at about 15 miles per day now, and it feels good, so we are definitely getting stronger. However, we adjust the mileage based on how we are feeling, how much climbing there is that day, where good camping spots are, etc. We aren’t sticklers mileage-wise, as long as we are basically on track. And it’s important the hike stays fun and we always see the beauty around us, so we won’t let the mileage become a grind. So, Chris, are you going to trim that beard when you shower or stick with your vow to keep it growing the whole trip? Loved the pic with the light behind the cacti! These posts keep the world in perspective! Thanks Margaret! We have seen a ton of flowering cacti out here, really beautiful. No beard trimming, just growing! Neither of us have read Wild, but we keep hearing about it. So far nothing has fallen off a cliff, and we plan to keep it that way. However, I’m sure it makes for a dramatic story in the memoir, and she has a good improvisation to solve the problem. I’m still waiting to see someone hiking the trail barefoot. No such luck so far!